The USS Howard W. Gilmore (AS-16) keel was laid on 21 December 1942 at Mare Island Navy Yard in California. She was launched on 16 September 1943, sponsored by Mrs. H. W. Gilmore, widow of Howard W. Gilmore and was commissioned 24 May 1944. AS-16 was named for Howard W. Gilmore, the Commander of the USS Growler (SS-215), who under enemy fire in 1943 ordered his sub to dive while he remained on the brigde. Growler was saved and Commander Gilmore received the Medal of Honor posthumously. After shake down Gilmore sailed for Pearl Harbor in August 1944 and then on to Majuro Atoll in September 1944. There, for four months, she supported the US Submarine froce that were fighting the Japanese. After picking up personnel and supplies in Pearl Harbor she departed for Brisbane, Australia, arriving in February 1945. Howard W. Gilmore next sailed to Subic Bay, PI. arriving in March 1945. She remained at Subic Bay through the end of the War. Departing for the United States on 31 August 1945, Gilmore touched at Pearl Harbor, transited the Panama Canal and arrived in New York City on 17 October 1945. Beginning in January 1946, Howard W. Gilmore was homeported in Key West, Florida. Until 1959, she never ventured beyond Norfolk to the north and the Caribbean to the south. The Howard W. Gilmore changed homeport to Charleston SC in July 1959. She spent nearly two years tending Atlantic Fleet submarines then was overhauled in Charleston NSY from November 1961 to May 1962. This Fleet Rehabilitation and Modernization Overhaul (FRAM) provided Gilmore with the ability to support nuclear submarines. After post overhaul fleet Refresher Training in Guantanamo Bay, Cuba, she returned to sub tending at Charleston SC. The Cuban Missle Crisis October 1962 push Howard W. Gilmore to full capacity as several sqaudrons of US submarines surged in to the Atlantic off of Florida and the Caribbean. As the Crisis receded, Gilmore resumed a normal tempo of material and technical support of US Atlantic Submarine Force. The 1960s passed with her homeported in Charleston with short cruises in support of various training operations. servicing two squadrons of submarines for Caribbean operations. 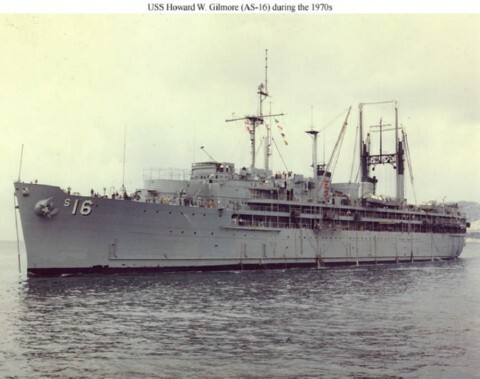 USS Howard W. Gilmore replaced USS Bushnell (AS 15) at Key West in 1970. From 1973 until 1980 Gilmore was homeported in La Maddalena, Sardinia, Italy. USS Howard W. Gilmore was decommissioned on 30 September 1980. Gilmore was laid up at the NISMF at James River Virginia, then scrapped in 2006. JAN 1951 - MAR 1951 Dry dock and gunnery refit Charlestown Ship Yard, Boston, Mass. Howard W. Gilmore (AS-16) originally Neptune but renamed before launching was launched by Mare Island Navy Yard Mare Island Calif. 16 September 1943; Sponsored by Mrs. H. W. Gilmore widow of Commander Gilmore and commissioned 24 May 1944 Captain D. N. Cone in command. For her first 2 months Howard W. Gilmore conducted shakedown training out of San Diego. After loading parts and supplies she sailed 12 August for Pearl Harbor arriving 18 August. Howard W. Gilmore arrived Majuro Atoll 19 September 1944 and began her vital tending duties. In the 4 months that followed she made voyage repairs on submarines replenished them and helped in training both crewmen and repairmen She thus did much to maintain the high intensity attack on Japanese shipping which hastened the end of the war. The ship also provided repairs and parts for surface ships when necessary. Returning to Pearl Harbor 29 January 1945 she took on replacement crews for Australia-based submarines and sailed for Brisbane arriving 23 February. But the busy tender was soon underway again this time sailing via Humbolt Bay to Subic Bay Philippines with supplies for an advanced base. Howard W. Gilmore arrived 13 March and immediately started refitting 7th Fleet subs and setting up a recuperation area for their crews. She continued this duty through the climactic days of the Pacific war sailing for the East Coast via Pearl Harbor and Panama 31 August 1945. Arriving New York 17 October Howard W. Gilmore took part in the joyous Navy Day celebrations in New York Harbor where the fleet was reviewed by President Truman. After a short stay in New London Conn. Howard W. Gilmore steamed to Portsmouth N.H. to load torpedoes and then sailed to her new home port Key West where she arrived 25 January 1946. Serving Submarine Squadron 4 the ship was to stay in Florida for the greater part of the next 13 years serving submarines on their far-flung training and readiness duties. The ship occasionally tended submarines at Norfolk and deployed to the Caribbean twice during this period notably for Operation Springboard a giant fleet exercise in the Caribbean in 1958. Howard W. Gilmore sailed into storied Charleston harbor 30 July 1959 to take up her tending duties from this new base. In addition to servicing submarines during the next 18 months the ship rode out Hurricane Donna in September 1960 off Charleston. During 1961 she operated off the Florida coast before entering Charleston Naval Shipyard in November for a major overhaul. During this repair period Howard W. Gilmore was fitted with facilities for servicing nuclear submarines increasing her versatility and usefulness for today's nuclear Navy. With this important Fleet Rehabilitation and Modernization overhaul ( FRAM ) completed the ship returned to the Caribbean for refresher training before resuming tender duties at Charleston. In October 1962 the introduction of offensive missiles into Cuba brought strong response from the American President and people; a naval quarantine of the island. Howard W. Gilmore's crew worked around the clock servicing two squadrons of submarines for Caribbean operations. American naval power forced the removal of the Communist threat to the Western Hemisphere. From 1963 into 1967 the veteran tender continued to serve submarines from her home port Charleston making short cruises for training off the South Carolina coast and in the Caribbean. Howard W. Gilmore and her sister tenders fulfill the goal expressed in the slogan: "Service for the silent service".